★ CAT\'S FAVORITE ★--Made of EVA, eco-friendly non-toxic material. Give cat a field of the outside world and a stable bed to enjoy the sun on the window. New Grey, Classic Khaki for you to decorate your home window. ★ PREMIUM ENJOY ★--Made of eco-friendly non-toxic waterproof EVA, the colorful cover is soft oxford cloth. Measure 25.5*10*5.5 in, rest space measure 21*7*5.5 In, large Space for cats. ★ UP TO 60 LBS ★--Four eco-friendly holds 60lbs, provide strong, lasting, stable force, make sure 100% sturdy, your cat jump on bed without worry. Buy once, Cat enjoy from kitten to big! ★ EZ MOUNT ★--Still using complex and big cat scratching post? 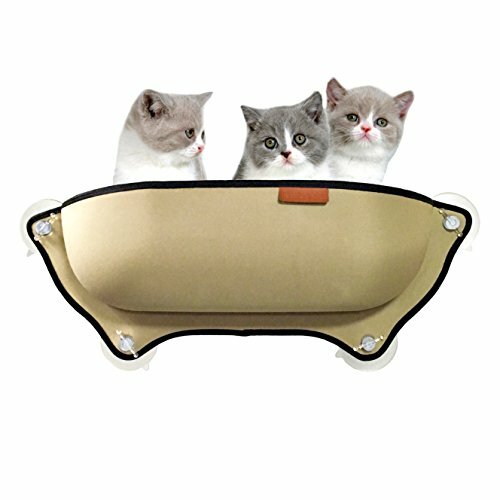 Try SSZY EZ Mount cat window bed, save your time and home space. ①Use water or alcohol clean the window and suction cups. Any dirty may make suction cups not sturdy. ②Set the suction cups on bed. ③Set sticks into cups. ④Put the bed on window. Unloaded easily, pinch the tail of suction cup. ★ 100% Satisfied! ★--Worry-free 12 month 100% Satisfied and friendly customer service. Not satisfied? Contact us, tell us problems you meet, we\'ll help you solve it until you satisfy, bring you more happiness. SSZY provides customers with a lifelong warranty since you choose SSZY. Max is intrigued, at least.